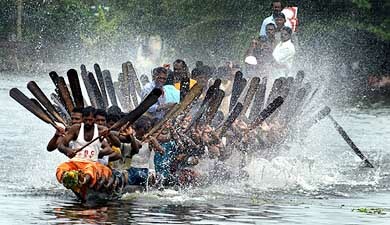 Trivandrum, 11 August 2012: The 60th Nehru Trophy Boat Race will be held today (11th August) at Punnamada Lake, Alappuzha. In the years, the annual Nehru Trophy boat race which is held at second saturday of August every year has become the event which marks the advent of Onam festival and the tourist season in the state of Kerala. This year Honorable Lok Sabha Speaker Smt. Meira Kumar will be the chief guest of the event. 20 snake boats (chundan vallams) will compete for the trophy and for a cash prize of Five lakh rupees. Separate race will be held for other boats, women rowers etc. The event will be telecast live on Doordarshan, and other private television channels.